TV commercials reach many people. It is just not possible to do justice to the ubiquinone-ubiquinol Q10 controversy in a 30-second TV commercial. The topic is a bit more complicated than that. 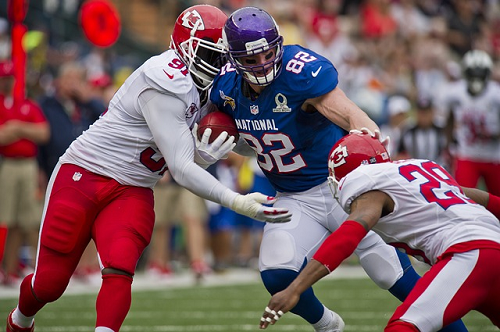 Commercial spots on prime time television must be expensive, right? Can we agree that the information in television commercials should be accurate? Is the Federal Communications Commission doing what it should be doing to protect consumers against misleading television commercials? Sometimes, it seems that consumers are being misled by the advertising of Q10 products. Dr. William Judy, long-time Coenzyme Q10 researcher and Chairman and founder of SIBR Research, told me that, one evening recently, his wife called to him while he was watching an Indianapolis Colts game in his home office. Mrs. Judy wanted him to come see a commercial running during the showing of a film on television. It was an advertisement for a Q10 ubiquinol product. As readers of this website will know, ubiquinol is the reduced form of Coenzyme Q10. It is sometimes designated as QH2. Ubiquinol is known to serve antioxidant functions in the body. The oxidized form of Coenzyme Q10, the ubiquinone form, is the form that is important for cellular bio-energetics, especially in heart muscle cells. It is always designated as Q10. The ubiquinol form is created in the body whenever the ubiquinone form is reduced. Ubiquinone and ubiquinol are the two parts of a redox pair. The one form (ubiquinone) is the oxidized form, and the other form (ubiquinol) is the reduced form. The ubiquinone form has been the object of research efforts for more than 30 years. Its safety, absorption, and effects are well documented. The ubiquinol form has only been available commercially since 2007 and is relatively little researched. More to the point, ubiquinone is the much more stable form. Ubiquinone is also the form that ingested ubiquinol is converted to in the stomach and small intestine prior to absorption. Researchers like Dr. Judy are puzzled that certain manufacturers are pushing the ubiquinol form so hard in advance of solid research showing better absorption and better efficacy than has been demonstrated for the ubiquinone form. To return to the TV commercial for the ubiquinol product that Dr. Judy saw: the ad showed the contents of capsules marked ubiquinone and ubiquinol being squeezed out into beakers of water. The ubiquinol was shown being rapidly distributed into the water while the ubiquinone was shown floating on top of the water. Dr. Judy realized that the passage of time had been speeded up for the commercial. He knows that it takes a considerable amount of time for the contents of a Q10 capsule to dissolve and diffuse through a water solution. It does not happen in a snap of the fingers as was shown in the ad. It would take at least 12 or more hours for the milky-white reduced Q10 to be converted to the orange oxidized form when placed in cold water. From Dr. Judy’s lab. 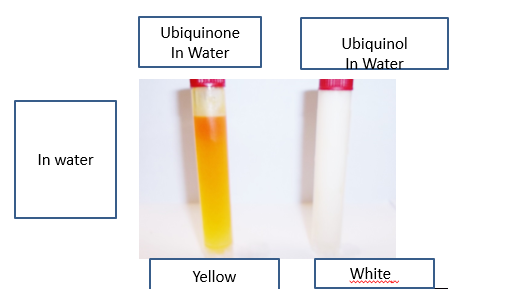 The ubiquinone in water is yellow-orange. The ubiquinol in water is still milky-white. It has not oxidized to the ubiquinone form. Very different from the TV commercial. That was the odd thing that caught Dr. Judy’s attention. In the ad, the ubiquinol being squeezed out of its capsule was shown to be orange in color coming out of the capsule. Moreover, the beaker of water with the ubiquinol in it was shown turning orange right away. Very strange, thought Dr. Judy. He knows that the ubiquinol form is milky white in color in the capsule and after being squeezed into a beaker of water. 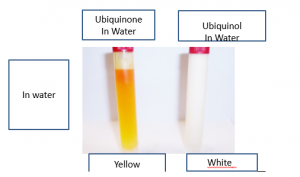 As Dr. Judy has seen in his labs, it is the ubiquinone form that has an orange color. Absorption as a water-soluble molecule? The crux of the ubiquinone-ubiquinol absorption controversy is whether the additional two hydrogen ions on the polar head of the ubiquinol molecule make the ubiquinol form more able to be absorbed as a water-soluble molecule. The TV ad was suggesting that the ubiquinol form is more soluble in water. Yes, okay, the ubiquinol form, with those two hydrogen atoms added to the polar head of the Q10 molecule, is slightly more water-soluble than the ubiquinone form. Okay. And, yes, the environment next to the side of the absorption cells in the small intestine is a watery environment. But, says Dr. Judy, even so, because of the larger total mass of the non-polar tail of the Q10 molecule, the overall effect is that the Q10 molecule, in either form, is still more lipid-soluble than it is water-soluble. And that is why the TV ad was misleading. Dr. Judy does not believe that the Q10 molecules, in either form, can be made into a water-soluble molecules. For one thing, the Q10 molecules are too large. The Q10 molecules with their 59 carbon atoms and their long non-polar tails simply cannot be absorbed through the water-filled pores in the absorption cell membrane in the small intestine. The thing is, Dr. Judy has data from his own lab experiments with the two forms of Coenzyme Q10 that show no statistically significant differences in the two products for absorption or bioavailability when given at 100 mg/day or 300 mg/day. Please click here for more information about ubiquinone Q10. ← Ubiquinone? Ubiquinol? What does Dr. Judy say?